Home / Local News / Formula One Hamilton and ‘monsters’ a hit . . . Formula One Hamilton and ‘monsters’ a hit . . .
Motor sport enthusiasts had the time of their lives over the weekend at the Festival Of Speed at Bushy Park in St Philip. Organizers would have been pleased with the thousands who turned up yesterday at the excellently refurbished and remodelled facility. Then, they would have been doubly pleased with a day that had it all for patrons, with Formula One champion Lewis Hamilton being the undoubted start attraction. Hamilton, who has basically adopted Barbados as a home away from home, gave his legion of fans an idea of what millions across the globe have enjoyed first-hand. The British-born of Grenadian heritage scorched the track in his Mercedes Petronas AMG, showing the driving acumen and skill with which he has become synonymous. 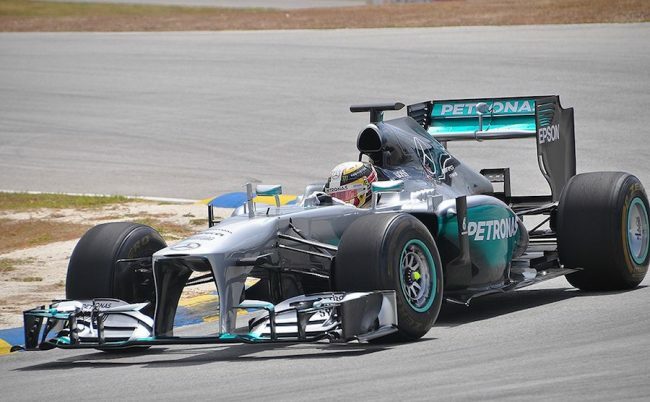 Lewis Hamilton was the star attraction at the Barbados Festival of Speed. Lewis Hamilton speaking to the media at the Barbados Festival of Speed. (Picture by Shane Lynton). Hamilton’s subsequent interaction with the go-karters was also a special moment for the youngsters. A spectacular move by one of the stunt bikers. Great dexterity being demonstrated by the monster ride Eradicator. (Pictures compliments of BFOS). Ty Cornelius goes aerial in the backdraught. Paul Breaud takes the Instigator over this bus during this exciting demonstration as fans look on. One of the many highlights of the occasion was the trip back-in-time with a demonstration of vintage cars, many of which ruled local roads back in the 1950s and 1960s. Fans were also treated to entertainment from the likes of the Zouave Band of the Barbados Defence Force. The Zouave Band of the Barbados Defence Force added to the occasion. Intermittent showers put a damper somewhat on proceedings late in the afternoon, affecting the action on the track. But, at the end of the evening, fans trekked from Bushy Park having had a thoroughly enjoyable and exciting day.